The GPText high availability feature ensures that you can continue working with GPText indexes as long as each shard in the index has at least one working replica. A GPText index has one shard for each Greenplum segment, so there is a one-to-one coorespondence between Greenplum segments and GPText index shards. The shard managed by a Greenplum segment is an index of the documents that are managed by that segment. The GPText high availability mechanism is to maintain multiple copies, or replicas, of the shard. The ZooKeeper service that manages SolrCloud chooses a GPText instance (SolrCloud node) for each replica to ensure even distribution and high availability. For each shard, one replica is elected leader and the Greenplum segment associated with the shard operates on this leader replica. The GPText instance managing the lead replica may or may not be on another Greenplum host, so indexing and searching operations are passed over the Greenplum cluster’s interconnect network. SolrCloud replicates changes made to the leader replica to the remaining replicas. The following figure illustrates the relationships between Greenplum segments and GPText index shards and replicas. The leader replica for each shard is shown in green and the followers are gray. The number of replicas to create for each shard, the replication factor, is a SolrCloud property. By default, GPText starts SolrCloud with a replication factor of three. The replication factor for each individual index is the value of the SolrCloud replication factor when the index is created. Changing the replication factor does not alter the replication factor for existing indexes. If a Greenplum primary segment fails and its mirror is activated, GPText functions and utilities continue to access the leader replica. No intervention is needed. If a host in the cluster fails, both Greenplum and GPText are affected. Mirrors for the Greenplum primary segments located on the failed host are activated on other hosts. SolrCloud elects a new leader replica for affected shards. 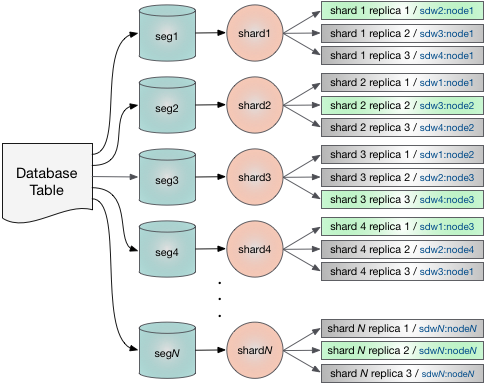 Because Greenplum segment mirrors and GPText shard replicas are distributed throughout the cluster, a single host failure should not prevent the cluster from continuing to operate. The performance of database queries and indexing operations will be affected until the failed host is recovered and the cluster is brought back into balance. SolrCloud is dependent on a working, available ZooKeeper cluster. For ZooKeeper to be active, a majority of the ZooKeeper cluster nodes must be up and able to communicate with each other. A ZooKeeper cluster with three nodes can continue to operate if one of the nodes fails, since two is a majority of three. To tolerate two failed nodes, the cluster must have at least five nodes so that the number of working nodes remaining after the failure are a majority. To tolerate n node failures, then, a ZooKeeper cluster must have 2*n*+1 nodes. This is why ZooKeeper clusters usually have an odd number of nodes. The best practice for a high-availability GPText cluster is a ZooKeeper cluster with five or seven nodes so that the cluster can tolerate two or three failed nodes. Refer to the Apache SolrCloud documentation for help using the SolrCloud Dashboard. The GPText gptext-state management utility allows you to query the state of the GPText cluster and indexes. You can also use gptext.index_status() to view the status of all indexes or a specified index. To see the GPText cluster state run the gptext-state command-line utility with the -d option to specify a database that has the GPText schema installed. To see the distribution of index shards and replicas in the GPText cluster, execute this SQL statement. To list all GPText indexes, run the gptext-state list command. The gptext-state healthcheck command checks the health of the cluster. The -f flag specifies the percentage of available disk space required to report a healthy cluster. The default is 10. See gptext-state in the Management Utilities reference for help with additional gptext-state options. The gptext.index_status() user-defined function reports the status of all GPText indexes or a specified index. Specify an index name to report only the status of that index. The gptext-replica utility adds or drops a replica of a single index shard. Use the gptext.add_replica() and gptext.delete_replica() user-defined functions to perform the same tasks from within the database. If a replica of a shard fails, use gptext-replica to add a new replica and then drop the failed replica to bring the index back to “Green” status. In the gptext.add_replica() function, add the node name as a third argument. To drop a replica, call gptext.delete_replica() with the name of the index, the name of the shard, and the name of the replica. You can find the name of the replica by calling gptext.index_status(index_name). The name is in the format core_noden. An optional -o flag specifies that the replica is to be deleted only if it is down. Here is the equivalent of the above command using the gptext.delete_replica() user-defined function.